This view looks southeast across Carson Street, from the intersection of Tenth Street. 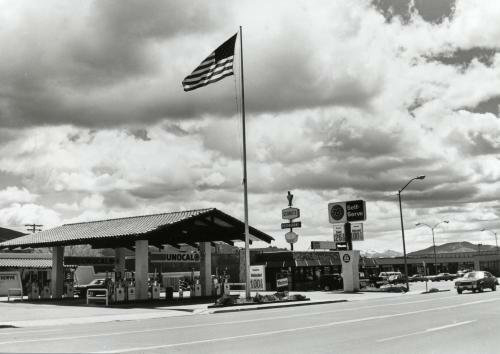 In the foreground is the Unocal 76 station, with a total of twelve gas pumps. The price for a gallon of unleaded is $1.00. Super Unleaded is $1.26. To the right of the 76 station is George's Restaurant. The sign is topped off with a martini glass, and the marquee on the roof advertises the "Silver Dollar Lounge". George's later was bought by the Carson Station and became the Station Grill. To the right of George's is the Carson Mall, stretching into the distance. Out of the frame of the photograph to the left is an A&W Restaurant.